Since I kicked off this blog series late last year I've not only talked about broadcast band (AM & shortwave) listening, but I've also provided audio with every post so you can hear the reception yourself. So far, all the recordings have been created by me and my dial twirling fingers. No longer. In recent posts, I've asked readers to submit AM and shortwave recordings as content for discussion in this series. And it finally happened. Somebody came through big time. And reader Ralph didn't just provide the audio and some notes (which was all I really asked for), but also offered up informative commentary with his scan of the 25 meter band (from June 28, 2006). Thanks so much Ralph! So, in this post you'll not only get some shortwave reception snagged by someone with more international radio experience and wisdom than me, but you also get a chance to hear a high-end tabletop receiver in action. It's an extra treat that Ralph took the time to write about the reception he offered, as well as talk about his shortwave radio experience in general. While this is a wonderful bonus, if you're thinking about offering your own bandscan or radio recording, I'm really only requesting the audio along with some logging if you have it. But it sure was nice to get this whole package from Ralph, and I hope you enjoy it as much as I have. Plenty of international voices in these archives, as well an excerpt of old Gene Scott showing why he's the still the most normal and manly evangelist on shortwave radio today, even if he's not a living being lately. But that's only one short moment in these recordings, which are divided up into four segments (for download) from this one listening session. Frankly, this is the first scan of a shortwave band that I've heard that I didn't make myself. I love the pure happenstance of shortwave tuning, and the sport of it (listen to Ralph try to make sense of a Syrian station with his gadgetry). The truth is you can really hear stations from around the world on shortwave, but unless you're local to a transmitter there's no guarantee that you'll be able to hear almost any station (clearly) at a given time. While the reception here isn't always solid here, the scan is rich in international signals. Although it's a fact that shortwave broadcasting (especially for listeners in North America) isn't what it once was, there's still quite a bit going on out there. I've been listening to WFMU, the coolest radio station in the world, for something like 20 years, and was delighted when the station started its own weblog. I was delighted and surprised when The Professor started posting about shortwave radio, one of the geekiest, uncoolest hobbies on Earth. Now this happens to be an area in which I have a fair amount of experience. I've been listening to shortwave for almost 30 years. I help produce a monthly magazine on the topic, serve as a member of the board of directors of the largest shortwave radio club in the Americas, and am webmaster of a popular and well-regarded site for that club. I think that in an earlier entry in the series, The Professor briefly mentioned how some people have elaborate setups with long antennas and expensive radios and such. So I figured that maybe the audience that eats this stuff up at Beware the Blog might be interested in what you can hear with an outdoor antenna specifically constructed to be good at receiving shortwave and a top-notch radio. On June 28, between 1855 and 2013 UTC (2:55 and 4:13 pm), I tuned through the 25 meter band, extending from 11500 to 12200 kHz, recording as I tuned. My shack is down the shore in Monmouth county, about 30 miles south of WFMU's Jersey City location. I'm about 5 miles from the ocean and maybe 2 or 3 miles from the bay. I have a couple of external antennas, one long piece of wire about 300 feet long, and another about 100 feet long in a configuration called a T2FD. My main receiver is an AOR AR-7030 Plus, a tabletop communications receiver designed by the genius English engineer John Thorpe. AOR offers an optional noise blanker and notch filter, and I had those installed when I bought the radio. When I sent the radio back to the U.K. for servicing a couple of years ago, I also had AOR retrofit the radio with the ability to receive digital shortwave broadcasts. The radio is basically all tricked out. One thing you'll notice as you listen is that most of these stations are the same international broadcasters you can hear with a portable receiver. There's often a conception out there that one of these expensive tabletop receivers are required to hear oddball weak stations. But the truth is that what these radios and the antennas associated with them really get you is better reception of the stations you can already hear for the most part, and the ability to "clean up" a messy signal to some degree. You can hear almost anything on a portable that I can hear on my radio. You probably won't hear it as well, and not as often. But when the conditions are right, you can do amazing things with a portable receiver. The reason to get a tabletop communications receiver is to do those amazing things even when the conditions are just shy of right. If you've listened to any of The Professor's recordings, you'll notice one thing different about these recordings: as I approach a station, you will hear a descending tone. The reason for this is that when I scan a band, I typically do so in sideband mode rather than AM mode. An AM signal consists of a carrier and two sidebands. The sidebands carry the audio information, and they are mirror images of each other. Someone realized many years ago that this meant that one of the sidebands was redundant, and that it was possible to transmit recoverable audio by transmitting only one sideband and no carrier. Radios that can tune sideband transmissions have the capability of generating their own carrier to replace the missing one on the signal. So how does this explain the descending tone? When I tune across an AM signal in sideband mode, the carrier of the AM signal and the carrier generated by the radio generate what's called a heterodyne; basically, the tone that you hear is defined by how far apart the two carriers are. A radio-generated carrier that's 800 hertz away from the carrier of the AM signal the radio is receiving generates an 800 hertz tone. As the tuner approaches the carrier, this tone drops in frequency. Ideally, with a radio with sufficient resolution, you can place the radio-generated carrier right on top of the signal's carrier. This is useful for a couple of reasons: first, on a weak, fading signal, the radio-generated carrier is likely to be far more stable, allowing the receiver to decode the sidebands without the fading one associates with shortwave. Second, when you've placed the radio-generated carrier right on top of the signal's carrier, whatever frequency the radio shows is the station's frequency. It's surprising how often they're a little bit off the frequency they're supposed to be on. In some cases, with stations that are known to be off frequency all the time, this can even help you identify the station. The tone that's generated by the carriers when they're separated is called a "beat", so when you've successfully placed the two carriers together, that's called "zero beat". Not all stations that generate a heterodyne have recoverable audio. So tuning in this manner is a good way to find even weak stations (although I wouldn't log a station simply based on hearing its heterodyne; that's considered bad form). There are radios out there that do this heterodyne hunting automatically. This feature is called "synchronous detection", and what happens is that the radio finds the carrier, locks on to it, and substitutes its own carrier automatically. You would think this would be something you would find only on expensive tabletop radios, but the two best synchronous detectors produced in a non-military radio are on portable receivers, the classic Sony ICF-2010 (now discontinued, but produced for 20 years, a testament to its high quality) and the brand new etón E1XM. The synchronous detector on my 2010 is far better than the one on my early Drake R8, and probably even a little better than on my AOR AR-7030 Plus. These radios are definitely at the high end of the spectrum of portables, but you can get a radio with an excellent synchronous detector for much less; the Sony ICF-7600GR typically costs less than $150 and has pretty much the same circuit that much more expensive ICF-2010 had. With synchronous detection, you can reduce the fading that can make shortwave difficult to listen to, and in most implementations, you can select one or the other sideband to listen to. That's very useful; if there's a strong station 5 or 10 kilohertz above a station you're trying to hear, tuning to the opposite sideband can make a signal that's being interfered with perfectly listenable. That's one reason I tune in sideband mode, but these portable receivers make it easy to do that at a fraction of the cost. The 25 meter band presented here is a transitional band; at times of low sunspot numbers, like now, it is mostly a daytime band; at times of high sunspot numbers, as we'll probably see in about four or five years, it's useful at night as well. At this hour of the day, the band is open to quite a bit of the world, including Europe, Africa, and parts of Asia. A few hours later, shortly before sunset at your location, European stations would likely be inaudible, but more Asian stations would be available. This is prime listening hours in Europe and Africa, so many of the broadcasts recorded here are directed there, and merely overheard here in North America. That's one of the neatest things about listening to shortwave is this ability to eavesdrop on the world. One other nice thing about this reception is a relative lack of U.S. religious and fringe political broadcasts. Personally, I'm not a fan of those broadcasts, and tend to tune right by. There are a couple of instances of them in these recordings, but they're far outweighed by national and even local broadcasters. This sounds like it might be Arabic via their transmitters in Wertachtel. One thing that's interesting about listening to broadcasts in languages you don't understand is that, once you've listened to a number of broadcasts, you can often figure out what kind of program is being aired. This is toward the end of the hour, and there are addresses in a number of countries being given. The largest international broadcasters often open postal addresses in other countries so that their listeners in that country can write them without having to pay for anything more than domestic postage. There's a brief stinger after the addresses that gives the identity of this station away; this brief piece of music is used in all their language services. News from India in English via transmitters in Aligarh. And tuned in just in time to get the ID at the top of the hour! 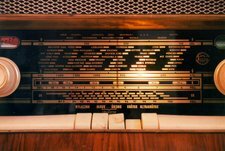 Shortwave is full of broadcasts like this, offering a different perspective on the news than we usually get in the U.S.
Russia's external service in Russian via Moscow. The news ends, then there's an ID for "Radio Compania Golos Rossii", just like what we heard a few seconds earlier from All India Radio. Radio is radio. One of the nice things about my tabletop receiver is that I can play with the sound, trying to get better reception by switching which sideband I listen to or engaging different filters. You can hear some of that here. Too weak to really tell. English via transmitters at Flevoland. Radio Netherlands is a station that definitely punches above its weight in international broadcasting. The people who make the programs there have a visceral understanding of what it means to make interesting radio of a certain sort. 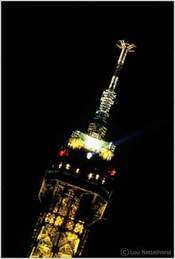 As a result, their programs often win awards at festivals like the International Radio Festival in New York each year. One other interesting aspect of their broadcasts is that they don't flinch from covering the darker side of life. So, for example, you get this program about alcoholism, something you wouldn't expect to hear from most international broadcasters. Radio Netherlands' programs compare favorably to those of the BBC, from a station in a country that doesn't speak English as their first language and made with a tiny fraction of the budget. They do it by deploying their limited resources carefully, by hiring excellent people, and by being clever. For example, when the BBC World Service shut down its shortwave broadcasts to North America a few years ago, Radio Netherlands seized the opportunity and bought up many of the now-silent transmitter hours for a few weeks so that when people tuned in expecting to hear the BBC, they would hear some excellent programming in English, but from Radio Netherlands. They couldn't afford to buy most of the time permanently (although North America did gain a morning broadcast from them that wasn't there before as a result), but they gained some listeners and some goodwill from the BBC's now abandoned listeners. Arabic music via Abu Za'bal. This is pretty faint, but you can hear the music, slightly distorted because I was tuning in SSB and didn't have a perfect zero beat here. There are a number of stations that broadcast hours and hours of Arabic music, many of which come in much more strongly than this. Arabic broadcast from the BBC via their transmitters in Rampisham. Whatever they're talking about, it has something to do with Israel. Arabic from DW via Wertachtel, Germany. French transmission via a relay in Cerrik, Albania. 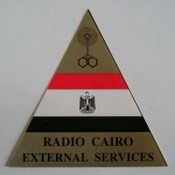 CRI is really an up-and-comer in international shortwave broadcasting. At a time when the BBC and Deutsche Welle are abandoning large patches of the globe and the VOA is cutting its English broadcasts in favor of focusing on surrogate home services in Arabic, Farsi, and other language, CRI is expanding its broadcasts. It's investing in relay stations to ensure that they're widely heard everywhere. And it has seriously upgraded the quality of its programming. This is not your father's Radio Beijing. If Radio Netherlands punches above its weight, RFI has long punched below its weight. Much like its insistence that French is the language of diplomacy long after English has usurped its former position there, so French is the language of international broadcasting. They focus largely on former colonies, so perhaps there's a justification for their approach. They have an hour or two per day to Asia and maybe a bit more to Africa in English, and most of the rest of their broadcasts are in French. They're well respected, particularly for their reporting in Africa, but within Anglophone communities perhaps not as visible as they could be. This station is a great example of a station that's worth listening to despite having no clue what the presenters are saying. Mostly, they broadcast music, and it's beguiling. Typically, there's a fair sprinkling of the local taarab music, mixed with Arabic pop, Indian filmi music, and African music, largely South African and Congolese style. I like the use this station as an example of how I switch between being a DXer and being a program listener. The first time I heard this station, I was thrilled to add a new station and a new country to my log. The next 70 or 80 times I listened, it was because I loved the music. I actually took to listening to this station most afternoons while I worked for a while. This particular reception is not the best representation of their programming. The reception is a little weaker than usual, and this kind of unaccompanied Arabic singing is not what I usually hear. That said, I still enjoy listening to it. RTZ typically starts fading in around mid-afternoon; given that it's summer and that this recording was made not long after the longest day of the year, that fade in is fairly late. In the winter, it's much earlier. There's a five minute news broadcast in English every weekday at 1800 UTC, relayed from their local FM station aimed at tourists, Spice FM. That's not so easy to hear at this time of year, but in the autumn and winter, it comes in quite clearly. Given that, this station comes in much better an hour or so later. Check out this bonus reception of Radio Tanzania Zanzibar from 2017 to their closing at 2100 UTC. RTZ is without question one of my favorite stations in the world. Many Arabic countries broadcast readings of the Koran. Saudi Arabia has a station entirely devoted to it. While the readings sound quite musical, it's considered offensive to describe it as "music" or "singing". The Saudi station is mixing with Radio Farda, a U.S. station aimed at Iran, broadcasting in Farsi and serving as a surrogate domestic service in much the same way that Radio Free Europe and Radio Liberty did for Warsaw Pact countries and the Soviet Union during the Cold War. Sadly, this is usually being done at the expense of the Voice of America, which has a reputation for impartial news reporting and probably does more good for America's image abroad than all of these surrogate stations combined. Finnish via Pori. This station recently decided to stop transmitting on shortwave, and in fact are already off the air. In lieu of this, they're saying they can better reach their audience of expatriate Finns via satellite and the Internet. They used to broadcast in English as well. Several years ago, they had a wonderful English service that broadcast a half hour a day, with a number of releases throughout the morning that were easy to hear here in North America. Then they moved their broadcasts to the North American evenings and largely lost their audience. I had a conversation with the head of Radio Finland at the Winter SWL Fest in Kulpsville, Pennsylvania, several years ago shortly after they made this move, and told her why I thought this was a bad move. In the evenings, they were competing against the dozens of other broadcasters who were trying to reach North America at the same time, and they kind of got lost in the noise. But their morning broadcasts, which coincided nicely with breakfast time across the continent, had little competition. I don't want to take credit for the move, but the next season they reinstated their morning broadcasts. Unfortunately, by then their audience had moved on, and it wasn't much after that when they discontinued broadcasting in English. That was a shame; they had excellent programming that I enjoyed listening to. The late Dr. Gene Scott® has been covered pretty extensively in The Professor's musings, but I have to say that I particularly like this clip where he talks about getting laid. This is a nice example of the Good Doctor's more eccentric approach to evangelism. Portuguese language domestic broadcast from the capital, Brasilia. This is a national service, aimed at areas in the Amazon and the interior of Brazil that are not well served by AM and FM stations. They play some interesting music, and, unlike international broadcasters, they include commercials. Latin America has a tradition much like North America's with small local commercial broadcasters dominating the scene as opposed to monolithic national broadcasters like in the rest of the world. Even a large national broadcaster like this one can sound like a commercial broadcaster. There are dozens of shortwave stations in Brazil, and this is one of the strongest and easiest to hear. The music here is clearly Chinese. Radio Free Asia, the U.S.' surrogate home service for China and a few other countries, is jammed by the Chinese using transmissions of traditional Chinese music. It's not uncommon in this circumstance for propagation to favor the jamming station and not the jammed station. So it's probably the case here that we're hearing the jammer, but not the jammed. That said, the fact that I can hear the jammer more clearly here in the eastern U.S. is no indication that the same is true in China itself; often times when propagation is different at the transmitter site and the jammer site, the jammer will have little effect on the transmission it is attempting to jam. German via Kigali, Rwanda. The largest shortwave stations, like the BBC, VOA, and Deutsche Welle, maintain numerous relay stations around the world. This way, the signal doesn't have to travel too far to reach its intended audience. 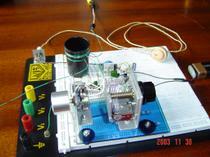 This transmission is from Rwanda, and is one of the easiest ways to hear that country. It's perhaps not as interesting as hearing Radio Rwanda though. Radio Rwanda is not an easy catch; its broadcast on 6055 kHz is usually covered by one European broadcaster or another. There is a five minute window from 2055 to 2100 UTC after Radio Slovakia signs off but before Rwanda signs off when Rwanda can occasionally be heard. Interestingly, that last five minutes of their broadcast every day is usually filled up with IDs in a number of languages, including French and English. Arabic via Qasr al Kharana. At this hour, there will be a lot of this sort of unadorned vocalization, which is often broadcasts of the Holy Koran. This is the same station as on 11740, but this time not mixing with Radio Farda. This transmission is aimed at Arabs in Europe. America is in the same direction from Saudi Arabia (just a little further away), so this broadcast typically pounds in here. Not sure who this is, but they're in Arabic. French via Emirler. There's an ID in French, "La Voix du Turkey", toward the end. The best source for IDs in languages you don't understand is the World Radio TV Handbook . They typically print IDs in many or most of the languages any broadcaster transmits in. So you don't need to speak the language in order to ID the station. Hausa, the language of northern Nigeria, via Ascension Island in the middle of the south Atlantic Ocean. Probably. I don't hear an ID, so this goes down as tentative in the logbook. Sounds like Chinese, but pretty weak. More of the same station as on 11820. The clicks you hear in here are the sound of me flipping between the two frequencies to confirm that they're the same broadcast. Finding parallel frequencies like this can be used as a way to identify stations in a language you don't understand. It's not as good as hearing an identification or an interval signal, but it will do in a pinch. America's anti-Castro surrogate domestic service to Cuba. Totally wiped out by those diesel noises. Not nearly as listenable as the Chinese jamming, is it? English via Kashi. Their English language program is closing. This is a good time to get an ID, as is the beginning of a broadcast. Portuguese to Africa via Lisbon. This station used to broadcast in English, but stopped about five years ago, along with all other foreign languages. Now they only broadcast in Portuguese, aimed primarily at expatriates and former colonies. On weekends, you can hear soccer broadcasts on this station, which are almost as animated as the Spanish-language broadcasts on Univision during the World Cup. English to Africa via São Tome, a small island off the west coast of Africa. This station is very weak. VOA is often much stronger and easier to hear, but not on this frequency at this hour. French to Africa via Moyabi, Gabon. This is relayed via the transmitters of Africa Numero Un, a commercial shortwave station broadcasting to Africa that plays some excellent African music. RFI also often plays some great African music and can be worth listening to in French for that. This is just a news broadcast, however. Arabic from the home of the Moors. Lots of talk about American-Arab relations. Not sure who this is, but they're broadcasting in Arabic too. Relay of their domestic service in Arabic via Abu Za'bal. Egypt is the home of much of the Arabic language music industry, so Radio Cairo can be worth listening to for the music. Unfortunately, they're legendary for their poor audio quality. English service via Moscow with the latest news. This is followed up with a program promo in the dulcet tones of Estelle Winters, an expat Brit who has worked for VoR for several years. That high pitched voice really cuts through the static. She came to the Winter SWL Fest in Pennsylvania several years ago, and served as the keynote speaker. She also brought a prize for the Fest raffle, a no-expense paid trip to a golf resort just outside Moscow (she was appropriately sheepish about it, but it was all she could get someone to donate). I was sitting in the back of the room next to two of my best friends when this exciting prize was drawn in the raffle. The one friend muttered to himself "Please, Dear God, not me" as the winning ticket was drawn; two seconds later, his name was called out, and I and our other friend burst out laughing. Syria's English service via Adhra is not an easy catch here in North America. I think this is English, but it's awfully muddled. You can hear me trying to adjust the radio to get a better sound, but nothing really worked. English to Africa via Ascension Island. This frequency used to be on the air pretty much 24 hours a day from a variety of transmitters around the world, and could therefore be heard at almost any time of day. With the BBC de-emphasizing shortwave, that's not so much the case any more. World Wide Crackpot Radio, from Nashville. I couldn't leave you without at least one example of the fringe politics and questionable claims that emanate from the modern day equivalent of Doc Brinkley and the border broadcasters. The odd sound here is a result of my not quite accurately zero beating this signal. That's it. Again, much appreciation to Ralph Brandi for his work and insight in providing the meat and audio for this post. (And you can check out his personal blog here.) I hope you can do this again sometime Ralph. But, it sure would be swell to hear some reception in this series from other reader/listeners as well. I like the bandscanning format a lot, but I'm open to historic or rare recordings of shortwave as well. And as far as bandscanning, I'd really like to hear some reception from around the country and the world, on AM as well as shortwave. If you're interested in making recordings of scans, or have some radio recordings sitting around that might provide compelling content for this series please send me an email. And if you'd like any tips or suggestions I might have as far as recording or encoding radio for the web, drop me an email as well. 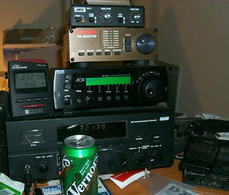 While it would be great to get more audio contributions from experienced DXers like Ralph, if you have an interest in shortwave or venturing through far off late night AM signals AND have a tape recorder, you could do this too. If you'd like to write about shortwave or the reception you've recorded (as Ralph has here), that's great, but not compulsory. However, providing a log or notes offering the frequencies (and local or UTC time they were received) would be extremely helpful. I'd really like to hear what it's like to tune across the AM or shortwave dial in Alaska, California, Luxembourg, Guam, New Zealand, just about anywhere (especially not in the NE U.S. and the Midwest, the only locations I've offered bandscan recordings from thus far in this series). My preferences are that there's some English language broadcasting in the mix, and that at least some of the reception has enough clarity to be understood. Always interested in comments, corrections, questions, and other relevant interaction. Please leave them in the comment box below or you can send me an email here. In the next post in this series I think 'll get back into the medium wave realm-- AM radio. Other posts on such topics can be found here. A real treat, this one. Thanks! Well that's just great post Ralph, now everyone will want to become a shortwave listener. Including me! Thanks for a great posting of stations from around the globe! We should mention to the new listeners of shortwave that the use of headphones is like moving 1000 miles closer to your station and will work just as well on the posted files here too. Remember to use "communication headphones" which will transmit only sounds found in the range of the human voice screening out much of the noise/hiss found in shortwave.